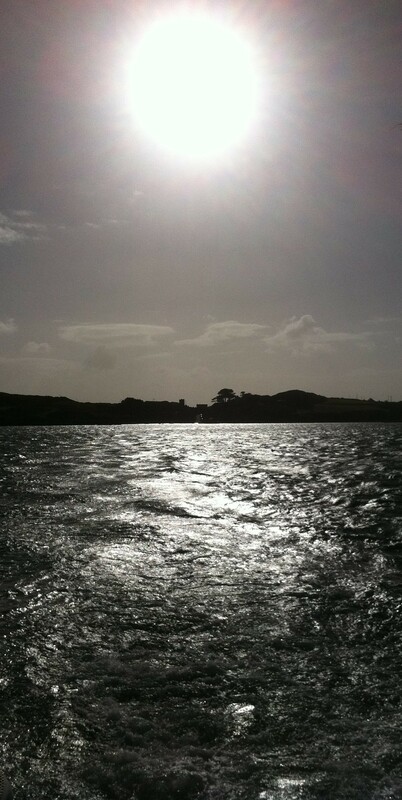 Leaving Sherkin Island, Baltimore Harbour, Cork. Ailsa’s travel theme this week is illuminated. This picture shows Sherkin Island in the distance as the ferry makes the ten minute trip to Baltimore on the mainland. Shooting straight into the sun probably isn’t the best idea, but it has created a lovely tarnished silvery light on the water and silhouetted ‘The Abbey’, the ruins of a 15th century Fransican friary located above the pier on Sherkin. What a lovely atmosphere you created with the direct sunlight reflecting on the water. It seems to have an ‘other worldly’ quality! The sun seems such an unbelievably huge glowing sphere Patsy – one feels something momentous is about to happen ! I love your description of its tarnished slivery light – so true . Love this photo Patsy – that glow is quite eerie. Even with the sun there it feels as though it could be night time. Very other-worldly! Lovely. Don’t you just love it when your island comes into site while riding the ferry. You are so lucky your island is so close. A joint post could be interesting. Accounts of your trips are just amazing. I know I have said it before, but you must have so much energy, drive and patience! Well worth the effort though. If you saw how cold this winter has been and how much snow we have at the moment I am sure you would drive the distance in a heartbeat. In parts of our yard the snow is over my three year old’s head. When we got back from the island on Sunday it was -40. It is hard to explain going from gardening on Friday to -40 and snow on Sunday. Does your island feel like a different world for you even though it is so close? I’ve seen the news coverage – it’s unbelievable! You must really feel that your two homes are worlds apart. ‘Our island’ is only two hours door-to-door yet feels like we are stepping off the world for a while. I think islands have that effect. We purposely don’t have a television there and rarely listen to the news on the radio so it really feels that we are getting away from the humdrum of everyday life. I only have to imagine myself there and I get that calming feeling!